Born: 22 May 1826, Kingsclere, Hampshire, United Kingdom. Died: 12 January 1898, Cape Town, South Africa. Langham Dale was educated at Queen's College, Oxford, where he was awarded the Bachelor of Arts (BA) degree with second-class honours in mathematics in 1847. On the recommendation of Sir John Herschel* he was appointed professor of English and classics at the South African College, Cape Town, where he arrived in August 1848. Soon there began a bitter controversy between him and James C. Adamson* over reforms needed at the College. Adamson resigned in 1850, while Dale introduced many reforms and reorganized the teaching. He personally presented courses in Latin, Greek, and English literature, the latter including grammar, geography, ancient and modern history, logic and composition. He also taught mathematics after Adamson's departure. From April 1858 to September 1859 he was in England on sick leave and on his return reported to parliament on the organisation and methods of British educational institutions. Resigning his post soon after his return, he was appointed superintendent-general of Education of the Cape Colony from December 1859, succeeding James Rose Innes*. He retired from this position in May 1892. During this period he was mainly responsible for starting state-aided schools in the mid-1860s, served on the Council of the South African College for many years, was a member and president of the board of public examiners from 1859 to 1872, and in 1873 chaired the commission that recommended the establishement of the University of the Cape of Good Hope, the first university in southern Africa (though an examining body only). 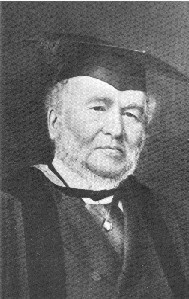 Dale became the first Vice-Chancellor of the university, serving in this position during 1873-1877, 1879-1882, and 1884-1889. He then became Chancellor until his death in 1898. The University of Glasgow awarded him an honorary Doctor of Laws (LL D) degree for his contributions to higher education as early as 1859, and he was honoured as a Knight Commander of the Order of St Michael and St George (KCMG) in 1889. He wrote various reports and articles on educational and related matters. In his limited spare time Dale became a pioneer in South African archaeology. His interest in the topic started around 1860, when his wife saw E.J. Layard* of the South African Museum opening a parcel of stone tools received from T.H. Bowker*. Dale collected artefacts, mainly on the Cape Flats, from about 1864. Most of his finds ended up in the South African Museum, but in 1868 he sent artefacts to George Busk in England, following a collection sent from the Cape by the latter's brother, Charles J. Busk*, the previous year. George exhibited both finds at the International Congress of Prehistoric Archaeology held at Norwich that year. His descriptions of the artefacts were published in 1869 in a paper, "Stone antiquities found in Africa", in the Transactions of the Congress. The same Busk/Dale collection was also described by Sir John Lubbock in a paper "On a collection of stone implements from the Cape of Good Hope", in the Proceedings of the Anthropological and Ethnological Society of London (1869, Vol. 1, p. 51) and in later papers. Some of these artefacts were later presented to the Christy Collection of the British Museum. They were among the first to be sent to Britain from South Africa, as well as among the first to enter the British Museum's collections. In 1870 Dale published the first local article on South African archaeology, "Stone implements in South Africa", in the Cape Monthly Magazine (2nd series, Vol. 1, pp. 236-239, 365-366), using the Greek letter "delta" as pseudonym. In this article he discussed archaeological remains found at many localities in the Cape Colony during the previous decade, and illustrated several artefacts. He was also the first to mention the contemporary use of some stone artefacts, by Khoi at the Cape and in Namibia, and (presumably by San) on the northern border of the colony. When sending further specimens to George Busk, Dale included a paper, "On a collection of stone implements and pottery from the Cape of Good Hope", which appeared in the Journal of the Anthropological Institute (Vol. 1, pp. 163-185) in 1871. Some of the artefacts had been collected by him on the Cape Flats and elsewhere, while many others had been collected by George McKay* near the Eastern Cape coast. A few years later Dale published a review of anthropological theories in the Cape Monthly Magazine (second series, 1874, Vol. 9, pp. 350-362). Dale became a foundation member and first vice-president of the South African Philosophical Society in 1877. He served on its council to 1881, when his membership ended. He was married to Emma Ross and one of his sons, also named Langham, was a member of the society in 1900. Langham junior added a number of specimens to his father's remaining collection of stone artefacts and presented portions of it to the South African Museum over the years. Cohen, A.B. Mary Elizabeth Barber, the Bowkers and South African prehistory. South African Archaeological Bulletin, 1999, Vol. 54, pp. 120-127. Cohen, A.B. Notes on stone tool collectors represented in the collections of the British Museum (Natural History). Unpublished notes, 2001. [Dale, L.] Stone implements in South Africa. Cape Monthly Magazine, 2nd series, 1870, Vol. 1, pp. 236-239, 365-366. Goodwin, A.J.H. Sir Langham Dale's collection of stone implements. South African Journal of Science, 1928, Vol. 25, pp. 419-426. Goodwin, A.J.H. A commentary upon South African prehistory up to the introduction of the new terminology. Bantu Studies, 1935, Vol. 9, pp. 293-333; bibliography pp. 387-413. National Automated Archival Information Retrieval System (NAAIRS). http://www.national.archives.gov.za/naairs.htm Documents relating to Langham Dale / L. Dale. South African Commercial Advertiser, 30 August 1848, p. 1: Advertissement: South African College. South African Philosophical Society. Transactions, 1877-1881, Vol. 1-2. University of the Cape of Good Hope. Calendar, 1875-1917/8.